Resistance to physical damage such as tearing or abrasion. 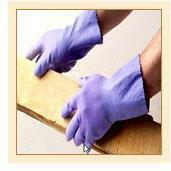 The dexterity needed when the gloves are worn. The extent of coverage required. Specific hazards such as electricity or volatile organic chemicals (VOC). Always inspect the glove for cuts or punctures prior to use To consider the risk of allergic sensitization when selecting rubber gloves rather than just choosing the lowest cost item available.